The engine of a vehicle has a combustion chamber where continuous explosions take place and as such the engine heats up very quickly. To stop the engine from overheating we take the help of coolants that flow through a radiator into the engine. The radiator’s job is to keep the coolant cool so that when it returns back into the engine it is able to absorb more heat. A radiator fan is thus used to keep the temperature of the coolant in check. Thus, it has an important job. If the radiator fan fails or is not working properly your car can get serious damage, to repair which you have to spend thousands of dollars. Therefore, as soon as you feel that the radiator fan is not functioning rush to the mechanic and get it fixed. A radiator fan can stop working due to some reasons. You need to know these symptoms to save your vehicle from a disaster. When a radiator fan works it usually makes a whirring sound that is easily noticeable. However, the radiator fan does not always start spinning on ignition. The ECU signals the radiator fan to work at the precise time. So, do not worry if the fan doesn’t immediately start working. Visually check the fan if you don’t hear its noise. Everything electrical is supported by a fuse so that if there is an electrical surge going towards a piece of electronic equipment the fuse cuts the electric supply to that particular equipment saving it from destruction. This is what we call a blown fuse. A blown fuse is no big deal and changing one does not cost a lot of money. If your car’s radiator fan is non-functional first check your car’s user manual and locates the fuse for the radiator fan. If the fuse is blown simply replace it and that should solve the issue for you. If the fan is not working even when the car is heating up there might be a problem with the wiring. You need to inspect all the wiring leading into and out from the radiator fan. It is possible that a wire has worn out due to heat and needs replacement. All you have to do is unplug the wires from the radiator and check their integrity by using a voltmeter. If both the wires positive and negative are transmitting 12 volts of electricity then they are fit. However, if there is any irregularity in the voltage supply then that means the wire is faulty and should be replaced. Similarly, if the wires are in perfect condition, you should inspect the relay that is tasked at supplying electricity to the wires. The relay is a small box-like structure that can wear out due to extensive use. Replace the relay and your fan should start working perfectly again. The ECU is responsible for starting the radiator fan once the engine gets hot. The ECU receives information from the temperature sensor which signals the ECU to initiate the fan. Therefore, if the temperature sensor is faulty, it is likely that the ECU is not receiving the proper signals and thus the fan is not working. 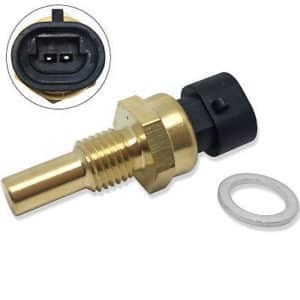 You can solve this by locating the sensor found in the thermostat cover under the hood of your car and cleaning it or replacing it with a new one. Cleaning a sensor is an easy job. There are hundreds of videos online showing you how to do that. Usually, after the sensor is cleaned it starts to work again. However, if it doesn’t, you need to replace it with a new one. A certified mechanic can help you with that. Sometimes it feels as if the radiator fan is not working even though it is. This is possible when the amount of coolant in your system is low. You should make it your daily habit to check the coolant levels in your radiator. If the coolant level is low you need to refill the coolant to optimum levels. Failing to do so, you could risk your engine getting seized. There is no coming back from a seized engine unless you are willing to spend a lot of money. 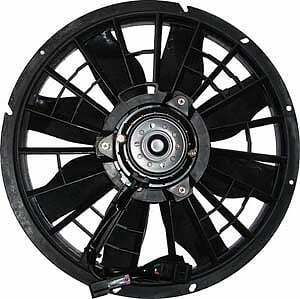 The fan clutch is responsible for holding the fan to the engine and turning it. If this assembly burns, you would have to replace it with a new one. If your fan is still not working after you have tried all the above mentioned things then a failing fan clutch could be the issue. Moreover, the fan belt could also be the issue. In older cars, the fan used to work with the help of an engine. Whenever the engine would start the radiator fan would start spinning. This was made possible through a belt that derived power from the engine. If this belt broke, your radiator fan would stop working completely. If you have tried everything mentioned above and your fan is still not working then that means it is time for you to invest in a new one. Just like every other electronic equipment the radiator fan also has a life. When it has completed its life cycle it just refuses to work. In this case, you need to visit your nearest mechanic and consult with them. A mechanic would initially check all the other things related to the radiator fan to make a proper analysis. A radiator fan is not very expensive and can cost around $200 – $400. It’s the fan motor that makes the radiator expensive. Your mechanic would charge you $120 to $200 depending on the make and model of your car and the nature of the work. Since the radiator is right in front your mechanic does not have to open any other component to remove the radiator fan. He might have to remove the radiator though which needs precision and skill.